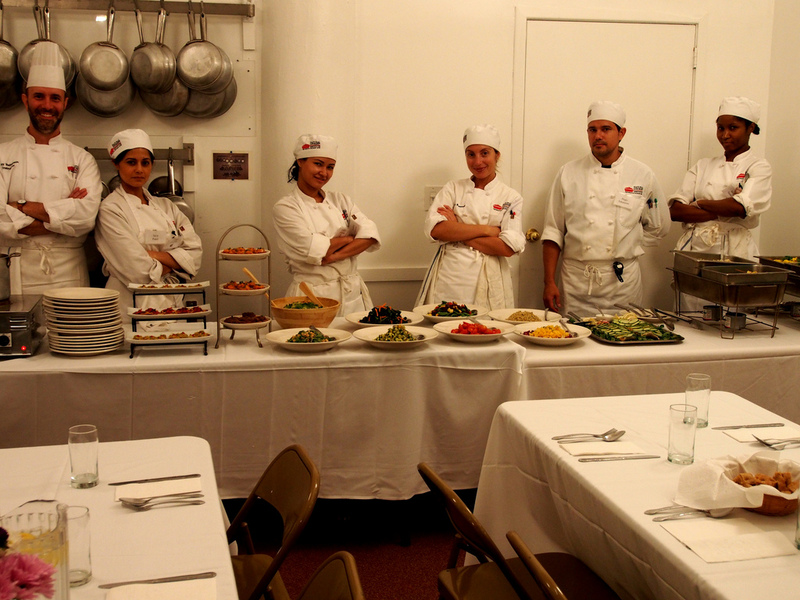 One of the important rites of passage in Chef’s Training is each group’s buffet class. In one day (part-time) or two days (full-time), students with their instructor prepare a lavish and healthy buffet for friends, family, and staff. The spread usually includes whole poached wild salmon, tempeh kebabs, and curried or garlic chicken at its center surrounded by a colorful, copious and seasonal array of salads, vegetables, grains, beans, and desserts – all made from scratch right down to the bread. There are always a generous amount of vegetarian and vegan options. Frequently, there are also improvised dishes made from seasonal, organic vegetables we have in-house. Buffet Class is a great opportunity for Chef’s Training students to show off what they do, and for guests to experience – for a mere $10 – a delicious, balanced, health-supportive meal Natural-Gourmet-style. Here we have pictures of the sumptuous buffet prepared by the small but mighty Chef’s Training Group 214. While the group has only six members, they’ve learned to do the same work in the same time as groups with the customary 16 students. You go, 214. Man, wish i could have been in a small class like that! A lot more experience and a faster rate.